SanDisk were a thoroughly impressive company during SFD5, and on reflection, a bit of an odd attendee at Tech Field Day. Why? Because TFD tends to be about enterprise technology, while most of SanDisk’s sales have traditionally been in consumer flash devices like USB drives and SD cards. SanDisk’s appearance at Tech Field Day was a suggestion that SanDisk was being far more serious about taking on the enterprise flash market. Only a couple of months later, SanDisk acquired Fusion-IO for $1.1bn (go read the risks section of this release. It’s hilarious.). Fusion-IO had a solid presence in SSD sales to the enterprise, though had too much exposure to key clients in Apple and Facebook. SanDisk’s manufacturing relationship with Toshiba, solid supply chain experience, and a more widely recognised brand, can only help the ailing Fusion-IO, which was struggling to turn a profit, despite selling what is apparently a good product. SanDisk were presenting mostly about their ULLtraDIMM product, developed in conjunction with Diablo Technologies. SanDisk provide the flash memory part of the package, which puts a DDR3 connector in front of an SSD, via a DDR3 to SATA bridge. It means you can connect an SSD to the memory channel of a server, instead of having to run through the data bus over SAS/SATA or PCIe. Why do that? It’s faster. The storage subsystem in a modern computer has to translate from the data format used by the CPU in order to communicate over the various interconnect types: PCIe, SATA, SAS, etc. That takes time to do, and the bandwidth and/or latency of the different connection types are also generally lower than access to memory. Memory is the fastest data access a CPU can have outside of its own internal registers. If we could just put everything in memory, we would (and some people do, like SAP HANA systems and other in-memory databases). But doing that costs a lot of money, and memory isn’t persistent, so if you lose power, you lose the data (unless you have a UPS and flush the data to persistent storage). ULLtraDIMM tries to solve this problem by putting persistent storage on the memory channel, bringing it closer to the CPU. It requires some custom driver software, and BIOS changes as well, because computer systems aren’t used to persistent storage being on the memory channel. It’s also not ideal to have a SATA bridge between memory and flash, but I’d sayd that’s largely a factor of speed-to-market. 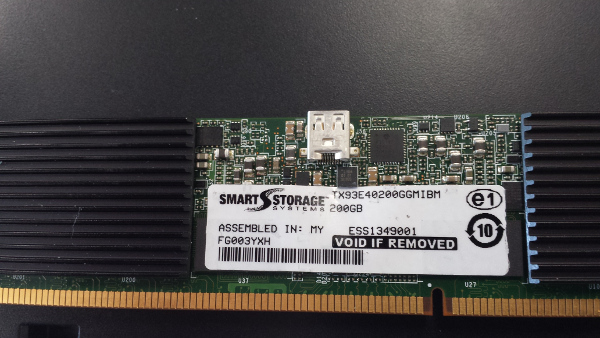 Flash storage has been built with SAS or SATA connectors because that’s what the previous persistent storage used, so it’s easier for the majority of computers to use it. The DDR3 interface is also a standard, so to bring the two together, a simple translation bridge is easy to build. Expect that bridge to drop away in the near future, as motherboard manufacturers start to incorporate the ULLtraDIMM style drivers into BIOS the way they had to when moving to PCIe and SAS/SATA interfaces from what came before (remember S-bus?). Then we’ll start to see flash directly on DDRx connectors, and get another bump in speed. SanDisk also have Guardian Technology™ that might escape your notice, so let me highlight it for you. Flash wears out as you write to it. There are ways to mitigate the effects, like adding more physical flash to a device, which is why SSDs are 100GB, not 128GB. The extra 28GB is used like “hot spares” in a RAID, so if a flash cell is about to wear out, the data is moved to the “hot spare” area. You can also extend the life of flash by using more expensive types of NAND flash, but that costs more. SanDisk reckon they can use Guardian to extend the life of cheaper NAND, so they can keep the costs of their flash down compared to competitors. This sort of advantage is not to be underestimated. Flash is pretty much a commodity, so it’s pretty hard to justify higher prices than competitors for fancy features (though not impossible). It’s also a market where the price per GB is dropping at about 36% every year. The percentage drop per year is decreasing, but not quickly. This all means that cost advantages are very attractive, so Guardian is very handy indeed. Which brings us back to the enterprise SSD market. It’s growing like crazy. Seemingly every week some storage company announces they’ve added an all-flash array, or some new flash hybrid, to their product portfolio. Samsung fulfil the majority of this market, but Micron and SanDisk are both growing volumes very nicely. With Fusion-IO added to the mix (and its handy bunch of patents) SanDisk are well placed to make a major impact on this market, and no doubt plan to make a bunch of money doing so. While actually achieving their goals isn’t without its challenges, that’s always the case, and SanDisk have been around long enough to know how the game is played. They have a bunch of smart, capable people, and a solid reputation for making quality products, so I’d say the future looks pretty bright for them right now. Tagged flash, guardian, sandisk, sfd5, ULLtraDIMM.